This entry was posted in Lake Map, News, Sediment and tagged aerial lake map, Aerial Map, Bathymetric Map, Bathymetry, Bio-Volume Vegetation Mapping, Capacity Curve Analysis, dredge cost, dredge plan, dredge planning, Dredgepack Data, Dredging, Fishing, GPS, GPS Lake, GPS Map, Habitat, Hydrographic Surveying, Hypack, IHO Compliant, Invasive Vegetation Mapping, Lake Bottom Hardness Analysis, Lake Management, Lake Map, Lake Mapping, Lake Survey, Profile (Thalweg) Survey, Sediment, Sediment Quantity Analysis, Sediment Surveying, Sedimentation, Side Scanning Sonar Data Collection, Sub-Bottom Profiling, Submerged Aquatic Vegetation, Submerged Aquatic Vegetation map, Survey, texas fishing, Texas Lake Map, Texas Map, The Mapping Network, USACOE, Waterfowl on December 26, 2012 by Moderator. This entry was posted in Lake Map, News, Sediment and tagged aerial lake map, Aerial Map, Bathymetric Map, Bathymetry, Bio-Volume Vegetation Mapping, Capacity Curve Analysis, dredge cost, dredge plan, dredge planning, Dredgepack Data, Dredging, Fishing, GPS, GPS Lake, GPS Map, Habitat, Hydrographic Surveying, Hypack, IHO Compliant, Invasive Vegetation Mapping, Lake Bottom Hardness Analysis, Lake Management, Lake Map, Lake Mapping, Lake Survey, Profile (Thalweg) Survey, Sediment, Sediment Quantity Analysis, Sediment Surveying, Sedimentation, Side Scanning Sonar Data Collection, Sub-Bottom Profiling, Submerged Aquatic Vegetation, Submerged Aquatic Vegetation map, Survey, texas fishing, Texas Lake Map, Texas Map, The Mapping Network, USACOE, Waterfowl on October 31, 2012 by Moderator. 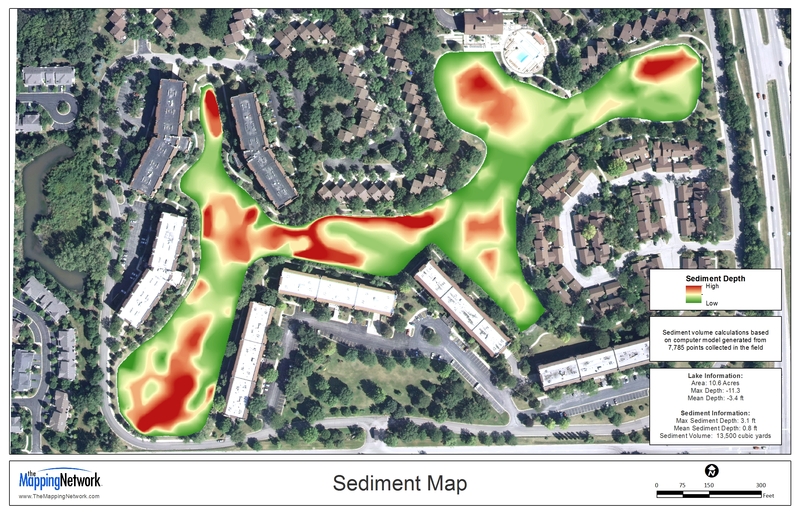 In 2012 The Mapping Network has successfully completed several automated sub-bottom sediment profile mapping projects throughout the United States for clients trying to quantify sediment volume and dredge planning. This mapping system logs sediment and water depth readings simultaneously, allowing The Mapping Network to chart the lake bottom with remarkable accuracy. Lake owners are able to have a clear understanding of how much sediment is in the lake and where it is located. Dredging companies then use this information to accurately bid and complete projects. Mapping lake sediment with this technology saves time, money, and materials by being informed and efficient with the dredging process. Due to the large expense dredging is for lake owners, this new technology has helped owners save time and money and more effectively budget and plan for projects. 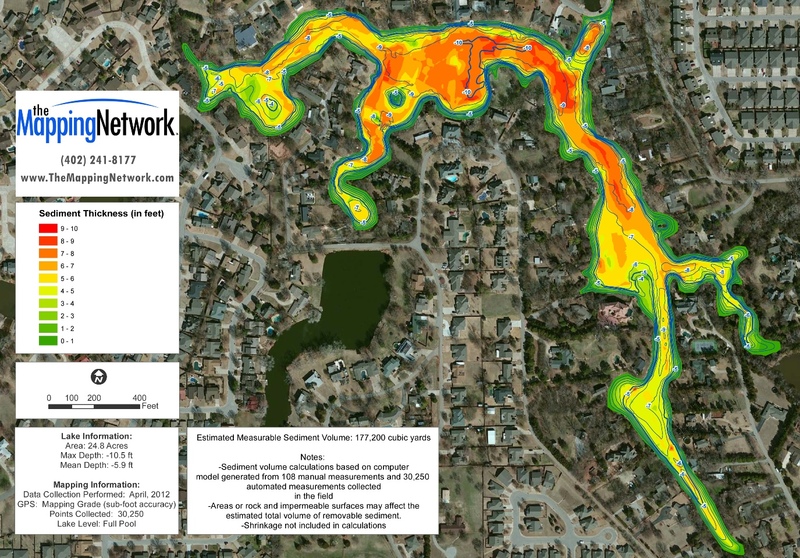 The Mapping Network, LLC is a business organized to perform Hydrographic and Sub-bottom profile surveys on lake and river systems for a wide range of clients throughout the United States. We operate from our office in Omaha, Nebraska along with fifteen highly trained Lake Management companies located around the country. We provide this service for a variety of client needs including generating bathymetry, sediment, and water volume information. The Mapping Network works directly with government organizations, lake associations, engineers, developers and dredging companies. Our company and personnel have been leaders in the development of tools and technology for hydrographic survey systems for over a decade. Since 1999, the staff at The Mapping Network began linking hydro-acoustic depth measuring equipment with Differential and RTK GPS receivers to create accurate and up to date bathymetry maps. Over the ensuing years, this technology has improved and our company has remained on the cutting edge of utilizing these systems to produce very accurate and cost effective bathymetry and sediment surveys. This entry was posted in Lake Map, Sediment and tagged aerial lake map, Aerial Map, Bathymetric Map, Bathymetry, Bio-Volume Vegetation Mapping, Capacity Curve Analysis, dredge cost, dredge plan, dredge planning, Dredgepack Data, Dredging, Fishing, GPS, GPS Lake, GPS Map, Habitat, Hydrographic Surveying, Hypack, IHO Compliant, Invasive Vegetation Mapping, Lake Bottom Hardness Analysis, Lake Management, Lake Map, Lake Mapping, Lake Survey, Profile (Thalweg) Survey, Sediment, Sediment Quantity Analysis, Sediment Surveying, Sedimentation, Side Scanning Sonar Data Collection, Sub-Bottom Profiling, Survey, texas fishing, Texas Lake Map, Texas Map, The Mapping Network, USACOE, Waterfowl on July 31, 2012 by Moderator.